Every year, people come from all over the country to join in the famous Pilgrimage to Cartago in honor of Costa Rica’s patron saint, the Virgin de Los Angeles. The most popular route is to walk the 13-mile hike from San Jose to Cartago. In 1635 a girl called Juana Pereira found a small statue of the blessed virgin Mary on the location where the Basilica is now built. She brought the statute home and returned to the spot where she found the it the next day. To her surprise, there was another statue. The third day, the same thing happened. She told her local priest, and he put the statues in a safe place in the church, the tabernacle, but by the next day, they had disappeared. They were later found in the same place in the forest where they had first appeared. The people of the town believed that The Virgin of Los Angeles had chosen to appear in the forest and that was where she wanted to remain, so they built a chapel for her in that exact spot. The chapel has been rebuilt several times over the years. The Basilica that stands there now was reconstructed in 1912 after an earthquake had damaged the previous one. Within the Basilica, you can see Juana Periera’s famous statue. Next to the Basilica is a natural spring where she found the statue in the forest, which is believed to produce holy water. You can visit this spring and drink from the water as well as queue to touch the rock on which the statues first appeared. The Virgin of Los Angeles was an apparition of the Virgin Mary, the faith of which was brought to Costa Rica by the Spanish in the 1600s. There have been a lot of Marian apparitions since the introduction of Catholicism. The most famous one is no doubt the Virgen de Guadalupe in Mexico. The Lady of Guadalupe is now the most visited pilgrimage site in the world as well as the third-most visited sacred site. The Virgin of Los Angeles became very popular in Costa Rica around the same time and was officiated as the patroness of Costa Rica by Pope John Paul II. Many miracles have been attributed to the Virgin. It is said that if one participates in the Aug. 2 pilgrimage to Cartago and asks the Virgin for something, it will come true. Among the main petitions are prayers for the health of loved ones. For over 200 years, it has been a Costa Rican tradition to walk en masse to the Basilica de Nuesta Senora Los Angeles of Cartago, to either give thanks to the saint or to petition her for advice. People of all ages come from all over the country for this annual blessing. 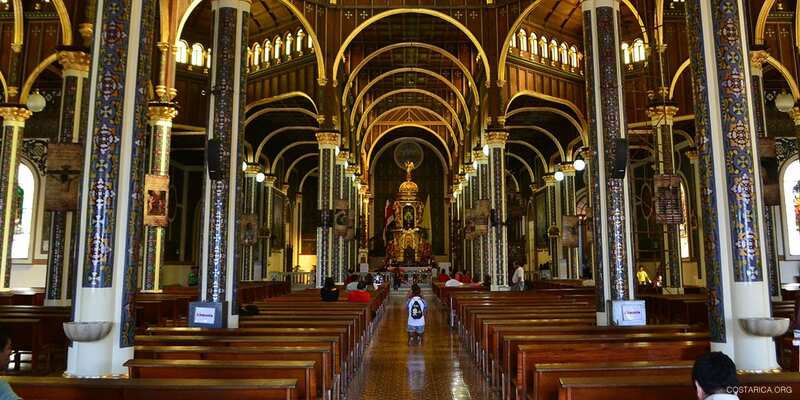 Although the official day for the pilgrimage to Cartago is Aug. 2, many people start walking as early as July 25th to allow time to make the journey, setting up tents and camps along the way. Red Cross stations are scattered along the way to support those on this strenuous walk. Supporters are located on every corner rallying the pilgrims to continue. Welcoming the pilgrims at the Basilica are performers playing music and food stands selling local delicacies. It’s a joyous, inspiring and uniting community celebration! A lot of Costa Rican homes will be decorated with a replica of the Virgin of Los Angeles, sometimes affectionately called “the Negrita” due to its black color. And although practicing Catholics may be diminishing in the country, the older generations still keep the tradition of the Romeria close to their hearts. Indeed, it is considered one of the most important traditions within the Costa Rican Culture.